Necklaces, pins, earrings and so much more featuring your favourite television shows and movies are all available for less than INR 500 at the online store, Something Different. When Rathnakumar Raghunath and Jere Franklin started Something Different, they didn’t realise that it would one day become so popular. Rathnakumar was always dabbling in DIY creations while teaching French and Jere, who teaches music, suggested that Rathnakumar put the DIY making to good use. And why not? Handmade goodies are some of the best things in the world and they not only make things that they love, but they also take custom orders. Started as a jewellery collection made with terracotta, Something Different has expanded their horizons into something more. The first ever product they made and sold was a terracotta pendant of Rajinikanth as Kabali just in time for the release of the movie. But while terracotta was popular and used a lot for handmade jewellery, Rathnakumar wanted to try something different, so he focused on nostalgic things and combined that with pixel art. 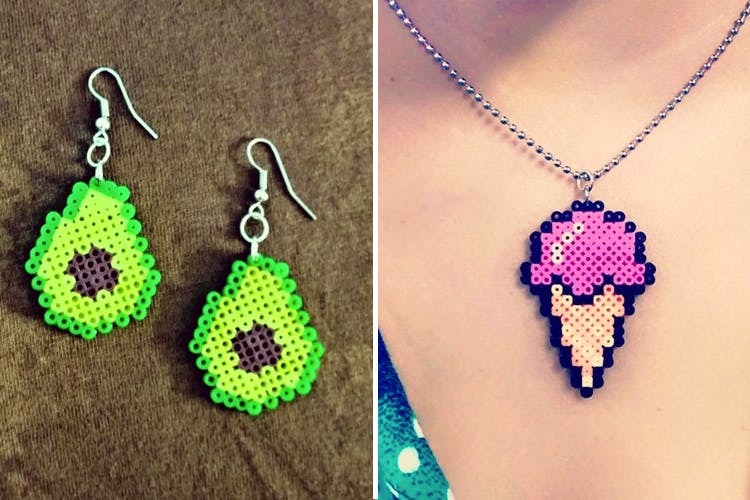 Can you imagine making jewellery inspired by 8-bit pixel art? Because it is something quite quirky to see. Rathnakumar did his required research and discovered that he could melt beads and have them fuse together to make it look like pixel art. And thus was the birth of the brand. The name says it all because they truly are doing ‘something different’ with jewellery, goodies and other things as well. After launching in April 2016, they’ve appeared at events in pop-up stalls and while they don’t have a store yet, customers can order everything by calling them. They use colourful beads, polymer clay, epoxy resin and of course, terracotta. Everything from earrings to necklaces, bracelets, and keychains can be made with these elements and that’s what they have in their catalogue now. They’ve also added wall art to their collection, featuring your favourites in a minimalistic form and are currently working on t-shirts. The best part? They ship to anywhere in the world and their products range from INR 50 to INR 500 depending on the kind of piece you’re looking to order. And right now they have a sale for the festival season and everything is 50 percent off, so make sure you hurry up and order because you don’t want to miss out on all of this.